As 2009 finishes...so does the 2009 VELLUM! Many Thanks for Another Great Year!! The first fermentation of 2009! VELLUM WINE PARTY THIS SUNDAY! Thank You for a Successful Release! It is easy to say each year, "This is the best wine we have made". In reality, the past vintages of VELLUM have presented many challenges. The 2007 and 2008 vintages had their share of struggles and miscues with the weather and the logistics of harvesting. However, despite these divergent paths, the wines in their own right are strikingly similar and equally outstanding. Although winemaking is never easy, for 2009 there were few trials or difficulties, colder weather and the wine (as it would seem) - "made itself"! The result is a vintage with amplified depth, focus, length and very early integration. I have never witnessed a group of wines which I have ever had the privilege to make come together so quickly. To fully appreciate the 2009 vintage, one needs to see the progression of our house style with the 2007 and 2008 vintages first. The wines of 2009 respect the restraint of its predecessors but exemplifiy the potential of our fermentation methods, cool temperatures and gentle but persistent extraction. Now, the entire 2009 vintage sits on its heavy lees (sediment) and awaits its first racking in January. It has officially finished its secondary fermentation. This is where the malic acid in the wine is metabolised by the beneficial bacteria Oenococcus Oeni and converted into the more subtle lactic acid. This fermentation is vital in stablizing the wine and preventing it from devloping any off flavors or aromas. Also, it is here that we mark the wine's beginning of its maturity. So, the 2009 VELLUM is ready for a long winter's slumber and as it rests we will go back to the 2008 vintage for the much anticipated task of blending...More on this next time! I hope that everyone can take time out to look back upon what went right for them this year. At VELLUM we are thankful for everything that fell into place for us and for this much needed time for rest and reflection. Since 2009 is coming to a close, I want to take this opportunity to thank those who have gone beyond every expectation to help us meet our winemaking goals...There are too many of you to mention here but if you are reading this - you know who are! Lastly, owing to a recent trip to England, I want to thank Johan Torgersen and Vegard Ellensen for helping me introduce VELLUM to their native Norway and to thank the charming literati, Miss Laura Hulley for her knowledge on the shared heritage of wine and literature. I was reminded that one cannot hope to create great wine without such a perspective. This afterall, is the core of VELLUM! Happy New Year to all and I hope 2010 is prosperous for everyone! Thanksgiving is our favorite holiday!! Despite the distance, it will be a great day of celebration - and though we won't share the same dinner table - we will all be sharing bottles of our family's fantastic 2007 VELLUM Cabernet Sauvignon. It's not too late to have VELLUM with your turkey dinner. Place an order this week and your 2007 VELLUM will arrive in time for the festivities! Or send a magnum to the loved ones who celebrate as our family does this Thanksgiving - separated by distance...but warmly remembered with a sip of wine and a toast to holiday cheer. The cool weather was definitely on our side for 2009 and it made my job easier but winemaking is never-entirely easy. There are many people involved in the process from the vineyard to the winery that help us every step of the way. We're not done yet so some of them will be digging out the tank for pressing of eleven tons of Linstad Cabernet Sauvignon later this week. This is never a simple task so my special thanks in advance for that! I think I say this every year, but without them VELLUM would not get made. So, I want to thank everyone who supported us and even helped us to successfully complete our 2009 vintage. We also had a great harvest party so I also want to thank all those who were in attendance and helped us celebrate the day. I think Jeff and I will continue this theme and looking forward to this holiday season, some much deserved rest and cracking open a few prized bottles of 2007 VELLUM. 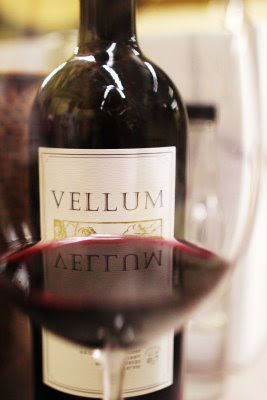 As many of you have experienced from our past vintages, VELLUM is a terrifically balanced wine. This is achieved not in the blending later on but by means of the extraction the new vintage goes through. A great wine like anything else can only be as good as the sum of its parts. No one will ever augment a finished wine by adding bad one to it. So, all of the parts need to fulfill a role and not only do they need to be fermented properly but also be pressed properly to obtain the final amount of extract from the skins and seeds. It cannot be emphasized more the importance pressing of the skins plays in the finish and therefore future success of a wine. Essentially, VELLUM is the combination of four separate wines: two Cabernet Sauvignons, one Petit Verdot and one Merlot. On a recent tour someone asked me why can't all the grapes be thrown together in one big tank? I would love to try this and I could get to sleep early at night too! However, in reality, like people the grapes for these wines have different needs and mature at different rates. Therefore, they are harvested and created at different times of the season. So we make four wines and when the fermentations are finished; we press four wines into four tanks. By this, instead of putting the "free run" into one tank and the press wine into another, it all gets combined into one tank. In many wineries it is common practice to do the contrary where a winemaker will end up with eight wines and blend back later...if at all. For VELLUM, the wines need to be whole and integral from their inception. Again, like people they need a body AND a spirit to fulfill their purpose. So pressing a wine rounds out the body to give the wine flesh and bone. The art comes in knowing when to stop! It is a balancing act of tasting the wine as the pressure increases gradually on the skins and seeds. Here too it increases in phenolic capacity. That is, it becomes more bitter and astringent as the tannins are removed from the pressings and added back to the free run. Many people think for a young Cabernet Sauvignon to be great in the future, it first should taste bad in its youth. I agree that no wine is at its best when it is first made but it is my belief that more than anything a wine a needs to obtain balance while young. The point is to build it a leveled and solid foundation from which it can grow. Thus far into the 2009 harvest we have three of the four wines for VELLUM in barrel. This year, seemingly every last drop of wine was pressed out of the skins and added back to the original free run. The wine benefited greatly from this marriage with no trace of bitterness or overly extracted tannins. The wines are big but will be tempered by time and gentle movement as they gain framework resting new oak barrels. So, there is still one wine out there to be made. Twelve tons of Linstad Cabernet Sauvignon (half our production) is still on the vines. It will be harvested tomorrow. My thanks in advance to Jeff, Brian, the Linstads and Francisco and his meticulous crew for what they are about to do. Mornings begin early in the vineyards and we get to start this process all over again for the last time in 2009. I for one (...minus the sleep) am looking forward to it! This morning we completed the pressing of our first fermentation of 2009 - VELLUM's Petit Verdot. The photos above show the grapes after they have been separated from the "free run". The grapes are dug out of the tank and loaded into a press to squeeze out the last few drops of wine. We taste the pressed wine to check for astringency and "bad" tannins as the press gradually increases pressure. This quality control allows us to maximize efficiency while minimizing "green" flavors in the wine. After fermentation and aging, the Petit Verdot is blended in small amounts with Cabernet and Merlot to create VELLUM's signature style. Deep, dark, rich colors - - paired with vibrant aromatics - - make this wine an integral component in VELLUM. Next stop for this wine...new French oak barrels!! Some of the best are featured above. The first fermentation for the 2009 VELLUM is underway! A few days ago we inoculated the must of the Petit Verdot and today the yeast have been multiplying quickly eating up the sugar in the grape juice. Unfortunately however the lifespan of a yeast cell is short-lived. Sometimes it is no more than a few days, but that is all that may be needed. Their purpose to winemakers is deceptively simple: consume sugar to make alcohol. Although in most red wines it is ideal for stability as well as style that the yeast which began the fermentation consume all of the sugar before their population dwindles and eventually passes on - - in reality, a complete fermentation takes great planning, control and mindfulness. It is very important too that all of this takes place in lower threshold but persistent temperatures (78-82 degrees F). In this environment the yeast may still thrive and produce its own heat but the wine greatly benefits by having its fruit and varietal character preserved. Here, a successful fermentation is quantified in very small fractions of a percent of residual sugar. Right now the Petit Verdot is at 79 degrees F and about 6 Brix (measurement of sugar content) but on Saturday afternoon it was at 24.1 Brix. A typical fermentation does not move at this rapid speed considering that it is fermenting at a lower temperature. Yeasts can perform in a wide range of kinetics where some metabolize sugar slowly as their population multiplies and lives longer and others may build up their population and consume sugar until they die quickly from the rising alcohol level. The yeast chosen for the Petit Verdot was neither, however in this situation it performed like the latter. So what is important to realize here is that the right yeast was chosen for the job as well as a proper fermentation strategy. To further aid the yeast, tomorrow the second of a process called a "delestage" will be performed. Here all of the wine will be removed from the tank and and then returned over the top of the grape skins and seeds gently. The intent of this process allows the yeast to obtain as much oxygen as possible to help live through this difficult stage as their food source depletes and environmental conditions worsen. Eventually, this fermentation will become "dry" when the sugar level is so low that it can no longer be considered a viable food source and the yeast will pass on - leaving our wine in its wake! What a beautiful morning in Napa Valley!! Bright and sunny, with a slight breeze and cool air...it was a fantastic way to begin VELLUM's 2009 Vintage. It's hard to believe that we are working on our third vintage of VELLUM. This year has gone by faster than ever - and our inaugural 2007 VELLUM is making its way into wine glasses of oenophiles all over the planet. It's probably evident, but Karl and I find deep satisfaction in making wine and sharing it with all of you. We are excited to see a new vintage of fruit start its transformation from sweet juice into succulent wine. Over the course of the next month, we will harvest grapes from 4 vineyards. Each of these vineyards contribute fruit/wine to our VELLUM blend. Our Bordeaux style is mostly Cabernet Sauvignon, with small amounts of Merlot and Petit Verdot blended for added complexity, depth and aroma. Today we hand-harvested our small lot of Petit Verdot. Petit Verdot is a darkly pigmented grape variety that imparts distinct characters of blueberry and spice to VELLUM. The vineyard - located on the eastern hillsides of Napa - yielded over 8000 pounds of fruit, a small amount more than last vintage, and we hand sorted the grapes 4 times before they reached the de-stemmer and stainless steel fermentation tank. Notice I didn't mention crushing? VELLUM grapes are never crushed - they enter the tank as whole berries, one of our signature methods for ensuring gentle extraction of tannin during fermentation. The juice tastes super-sweet with great acidity...and I can't wait to see how this develops after the addition of yeast. But first we will let it sit in tank, cold soaking for 48 hours. Our next harvest day will probably be next week - as the Merlot and Cabernet blocks are quickly approaching full development. Stay tuned as we dive in to HARVEST 2009 !! The high sugars and woody seeds signal full development. But more importantly, the malic and tartaric acids in our Petit Verdot are perfect for maintaining a balanced wine during fermentation. We expect to harvest about 3 tons from this vineyard, located on the southeast side of Napa County. The vineyard is on an east-facing hillside at about 400 feet in elevation. It gets great sunshine during the morning and midday, but cools down a bit in the afternoon. And the views from the property are spectacular! Monday morning will mark the beginning of VELLUM's third vintage. Wow - how time flies! And as if harvest isn't keeping us busy enough, we will be showcasing the 2007 VELLUM Cabernet Sauvignon at a handful of events this month. On September 26th we will be pouring wine at Fullerton, California's "Fullerton Uncorked" event. That evening we will also serve the 2007 VELLUM as sponsor of the Sixth Annual Cal State Fullerton Alumni Association Wine Tasting. Why so many Fullerton events? Well, that's where I got my start in Agriculture - as a member of the Fullerton High School Chapter of Future Farmers of America. With so many family and friends in Fullerton, VELLUM is proud to be a part of the community. We hope to see you at the events on the 26th!! The 2007 VELLUM is available for purchase here. The 2009 harvest season is well under way for most of Napa Valley. But our fruit is still a week or two away from being ready for picking. It looks like the Petit Verdot will be the first vineyard we harvest. The brix levels (sugar content) has been rising steadily and is now approaching 23 degrees brix. We try to keep all of our fruit at about 23 brix in order to maintain a lower alcohol. VELLUM's balance is dependent on keeping alcohol levels in moderation. For instance, the 2008 VELLUM will likely be 13.85% alcohol at bottling. Low brix at harvest is ideal, but we also pick based on acidity, tannins and seed development. The rains on Sunday helped to push back our harvest dates. Wet days in the vineyard mean lower brix levels and longer hang time. We are very happy! Over the next few weeks we will spend countless hours in the vineyards, sampling berries (pictured above) and maintaining the fruit as it enters its final stages of development. Saturday afternoon was a hot one in Napa Valley. But after such a moderate growing season for VELLUM's vineyards, we certainly have nothing to complain about. The 2009 vintage is looking like a legendary one! Our Cabernet Sauvignon is about halfway through veriason, the time when the grapes turn from green to purple...beginning their final ripening stages. As grapes ripen, the level of sugar increases and the grapes start to swell with juice and pulp. The fruit acids called malic acid and tartaric acid begin to shift in proportion. And the closer we get to harvest, the sweeter and more delicious the grapes become. During these next few weeks, we will be walking the vines to monitor and perfect each individual vine in our vineyards. Yes - we stand in front of each vine (hundreds and hundreds of them) and manicure each one based on its individual needs and fruit expression. We determine the appropriate amount of grape clusters for each vine - and we even pull individual leaves and shoots to adjust the amount of sunlight that reaches the clusters. By shaping the canopy of the vine, we can have a significant positive effect on the overall quality of the grape clusters. Come join us in the vineyards sometime - for there is much more to share about the development of a VELLUM grape. After all...fine wine starts in the vineyard!! Recently, Jeff and I toured the Linstad Vineyards to get a preview of the Cabernet Sauvignon. We were very pleased to see so many well developed but loose clusters with small berries. This was a product of good vineyard management by Jerry Linstad and by the favorable weather we had in early Spring which brought a lot of ground water and no frost. An abundance of clusters were formed and left on the vines to bring down the berry size prior to veraison (when the grapes begin to ripen and take on color). This method of control helps ensure a better ratio between the seed and skin and will ultimately produce a concentrated and flavored grape. Along with these practices and the stretch of cool weather we've been having, we are anticipating much more intensity in the fruit from this vineyard this year. In about two weeks when veraison starts, we will have a better idea about what 2009 will bring for VELLUM's Linstad Vineyard Cabernet. I expect this to be an extraordinary integral wine and serve well as the foundation for the 2009 vintage. We'll keep you updated! I want to thank Alison Frichtl for hosting our wine tasting group's recent white Burgundy tasting. I usually do not make mention of other wines in our blog but it was unanimous that out of ten wines from the region, the Puligny-Montrachet La Garenne Etienne Sauzet 2005 was the true star. It stood out even among the other Puligny-Montrachet from the same producer. It had a floral nose with slight oak in the backround. The palate was full with lots of acid and succulence and the wine seemed to go down in waves with an extremely long glycerol filled finish. Whew! I am still thinking about it now. These are the types of wines that bore into my brain. The last one to do this (aside from VELLUM) was a 2002 Quintessence de Corton-Charlemagne... with hints of crushed aspirin and long, long finish. Since I dropped VELLUM nicely into that review:); it has recently come to my attention that I have never taken the time to assess what our wine really is to me personally. Nobody until now has asked what I think it tastes like and I cannot believe it has taken this long. I think it takes the right person to ask the right question! "The wine is St-Julien on the nose with fresh but austere red fruit, bramble, espresso grounds (or graphite) and cardamom. It has restrained French oak left to linger as a remote afterthought. The aromas evolve slowly and they make me think about what I am about to taste. The palate ties in with the nose and it is a transition without any surprises. I taste what I smell and the combination is heady. The acid frames the entire mouth and lets the powdery tannins fall gently front to back. The wine is seamless and perfectly balanced from tip to tail; integrating the tannin, acid and alcohol. The length on the finish is very long and comes in waves (going on three minutes now). The wine resembles some of the top estates of St-Julien." These musings are not as easy to express as they seem. To look at one's creation is to critique oneself and this exercise certainly must be borne with a measured dose of humility! I suppose I only needed some coercion. Again, I want to thank the intriguing fan (from Alabama) who had the wherewithal to ask a simple but well put and well timed question. Those are always the best. As an aside, and to make the title of this BLOG relevant... a simple question that I have been longing to know the answer to: Is there any record that the Romans conducted wine tastings the way we do today? We are thrilled to announce that VELLUM will soon be featured at WineStyles in Vacaville, CA!! On Sunday, July 26th from 5pm-7pm please join us at WineStyles to celebrate the introduction of the 2007 VELLUM Cabernet Sauvignon. All are welcome to attend - to hear winemaking notes from VELLUM Winemaker Karl Lehmann and to enjoy live music with Gianna Biagi. 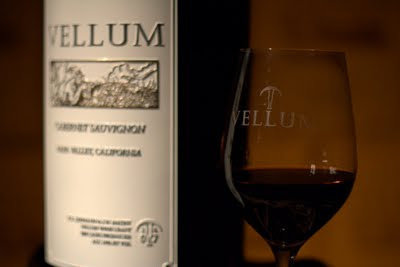 In May we debuted our 2007 VELLUM Cabernet Sauvignon at release parties around California to great success. However, on June 24th for the first time VELLUM's 2007 vintage was presented in Napa at BakerStreet Downtown. We were fortunate enough to have our wine paired with the world renowned cigar brand C.A.O. International. So, as an unapologetic cigar lover it was my honor to have VELLUM match so well with my long time favorite CAO Brazillia label. It was a classic pairing brought together by Brenda Roberts, the proprietor of BakerStreet Downtown. I want thank her for this enriching experience and I was very pleased to see how well the Napa Valley community received our first wine. I also want to extend a special thanks to Frank Kapp and Ed Trevino from C.A.O. International. Their insight, understanding and shared appreciation for the craftsmanship of cigars and wine made for a complete evening. And...Thanks again to all in attendance - we hope to see you again at future events! 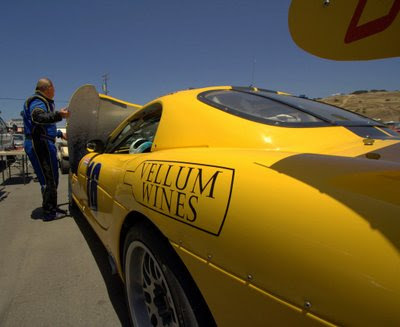 This past week Jeff and I decided on a departure from the quiet wine country setting to reach an entirely different audience that may not know we even exist...Hmm...How about... Vellum Wine goes racing! There are many ways draw attention to a wine: having old cellars, stacks of barrels, vineyard dogs or parties with only your wine being poured. In advertisements, most wineries opt for the tried and true picture of an expansive vineyard with someone in the center holding a glass of wine as the sun sets behind them. You see it all too often... so we thought that it's time for a change of scenery. What brilliant luck!!! Through an unlikely turn of events, it just so happened that the SCCA GT2 racecar team of John Shine and John Pecora graciously afforded us a decal space on their car. What a windfall- I certainly did not see this coming! On June 21st, for the first time, the GT2 sportscar burned up the track at the Laguna Seca Raceway in Salinas, California. 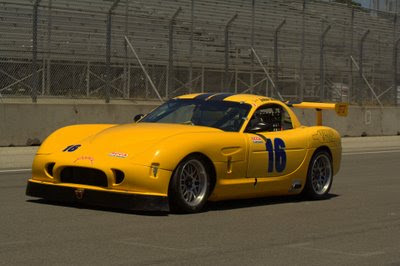 It was a great day to be trackside with John Pecora as driver John Shine accelerated past us out of the corner. It was a real thrill to be so close to the action. I felt the heat, the noise and energy of the cars come at us. If any of you have never seen sports car racing before... Please go. These are not the same cars that drive flat out in an oval for hours... and the events are not televised. This is real nuts-and-bolts racing! I will be back again - I'm hooked - and I am still not used seeing our logo zoom past me at speeds I may never see in my lifetime... Or maybe I will? I should probably check with my insurance agent first! 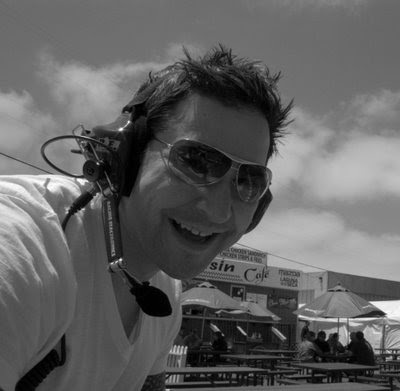 :) My thanks again to John Pecora and John Shine. I hope you win the series this year! I also want to thank cinematographer Alexander Kieselstein- without his expertise behind the lens all of these pictures would be a fuzzy blur! On Saturday evening Karl and I sampled the 2008 vintage and experimented with blends of our different wine lots. Vellum's fruit is sourced from 3 world-class vineyards in Napa County, mostly from the part of Napa Valley called Coombsville. We started the evening with a sample of what we call BDX. This is a blend that we created shortly after fermentation completed - from Petit Verdot and Merlot - our two most aromatic wine components. In glass, the BDX was an intense ruby color with a slight purple hue. The first thing I noticed about the wine was its beautiful strawberry and rhubarb aroma, brimming with freshness. Before even bringing the glass to my nose I could smell the fresh fruit flavors mixed with a strong note of sweet briar. In the mouth the wine reflected the nose, but added a strong dark cherry element. The acid (pH 3.67) was well-structured and created a great framework for the deep fruit. Sweet oak was present but subtle. And with an alcohol level of 13.9% it was well balanced and lingered in the finish. Next we tasted Cabernet Sauvignon from our producer in the Chiles Valley AVA, a highly underrated area of Napa County. This Cabernet was deeply colored and full-bodied. In the glass it had a deep inky purple and red saturation. It carried Vellum's characteristic "espresso grounds" note very strongly, mixed with dark berries. The wine tasted phenomenal - reminding me of cherries, blackberries, cooking spices and even raspberry compote. The tannins were of a very fine grain, falling mid-palate. The acid and alcohol on this lot was very similar to our 2007 vintage - pH 3.56 and alcohol 13.91. Finally we poured the Coombsville Cabernet Sauvignon. This wine makes up the majority of our production and is unique in its long hang time on the vine. This Cabernet Sauvignon fruit is typically harvested last in the season...sometimes into November. And yet we are able to bring it in with sugar levels far below the industry average - A GOOD THING! The wine was deep red with hints of purple...smelling of cherries, dark berries and fennel. Karl and I both noticed how remarkably "wild" the wine tasted. And I think the 2007 VELLUM reflects this as well. We have a wild character in the wine that is hard to describe...yet it is intriguing and attractive when poured out of bottle. Try it for yourself and you will know what we mean. There was also a really great yeasty note - funky and complex. In the mouth the wine had lots of weight. It was succulent and mouthwatering with fine powdery tannins. The palate matched the nose and carried a lingering black cherry flavor through to a very long finish. Overall, the 2008 vintage is developing into a very elegant wine. We expect the final 2008 Vellum Cabernet Sauvignon to be very similar to the 2007s but with a bit less alcohol and oak influence. Balance and integration are paramount to us - and we will continue to shape the 2008 vintage in a way that reflects those ideals. Now back out to the vineyards for the upcoming 2009s! A few times a month Jeff and I try about thirty wines from around the world with a close circle of wine professionals. We are there to examine wines for what they are regardless of their quality and trueness to type or region. Usually ten to twelve lesser known wines are selected blindly and placed in order to follow one another as a logical progression to prepare one's palate - whites, light reds, dark reds ,off dry and others (e.g.- Retsina...look it up!). Despite what we think, this order is not absolute. In fact, many times we get it wrong! Where we think a wine should place, more often than not the order should be switched. Recently, a small production Pinot Noir we had in the last tasting from Central Otago, New Zealand had more depth and character than both the following Chilean Cabernet or the Tannat from Uruguay. To me this was a surprise. I expected bolder flavors and body at least from the former but that did not happen. The Pinot we consumed had the tannin, structure and the lingering finish. This is not the image we have of this variety. At least in Californina we think Pinot Noir is a light bodied, translucent red full of black cherry and gamey flavors. Our perception seems skewed not only by the domestic market but by what the we think the "New World" style should be. I believe it is correct thinking to admit that we are in need of a change on how we view wine style and what we expect for our dollar. Some wines are poorly made or subject to adverse growing conditions and it shows in their composition as well as their value. This can be easily remedied in the hands of a creative winemaker who can make more with less and add a refreshing signature that can leave us guessing. However, our current wine industry has been globalizing in recent years to bring about a homogeneity of "New World" style which is not only economical to produce but it enables wineries to neatly type cast any variety. This past week has been a valuable lesson to me. Wine does not require a fixed image for us to enjoy it. So, I would encourage everyone who has even a remote interest in wine not to fall prey to mass market trappings. Go off the beaten path to discover unknown producers. Smaller is not better but it is a good place to start. Research who you are dealing with if you can. It has been my experience with hundreds of producers that good people generally make good wine and the opposite has also held true. Finally, challenge your mind, your nose and palate on what a grape variety should be. You may pleasantly deceive yourself (as I have) and understand that with wine - - style is everything. Well... Not much of an encounter... Actually it was a Kangaroo steak that ended up on a plate in front of me! It was my first taste of this "pesky critter" (as I am told) and I did quite enjoy it. 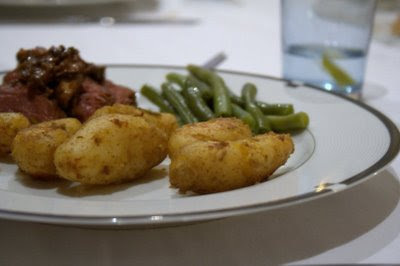 It was lightly seasoned, pan fried on the rare side in a Porcini reduction and served with new potatoes and green beans. As I was eating it I did wonder why don't male Kangaroos have pouches?...They have stuff to carry too! Alright...not my joke but I must say that I did expect a "gamey" flavor from it, however there was none of that - it had a slight tender beef character. I enjoyed it with a pairing of The Willows Vineyard 2004 Bonesetter Shiraz. This wine was extraordinarily silky in texture with a fine forward tannin composition and clean. There was also a very present blackberry note on the nose which carried on to the palate. 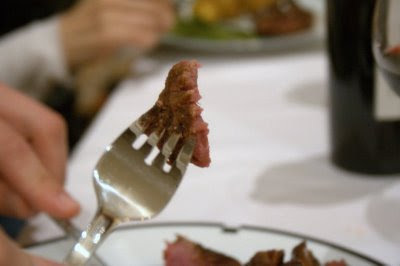 This was the hook for me that provided a surprisingly good match for the Kangaroo steak and the subtle Porcini mushrooms. Join us for the celebration! 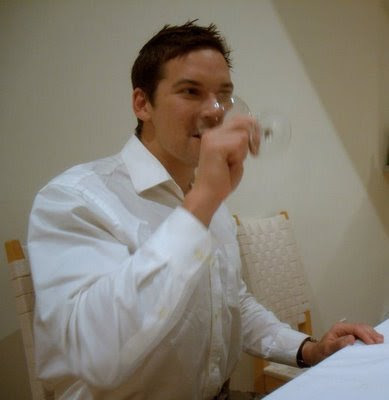 Meet Vellum Winemaker Karl Lehmann and sample delicious treats - perfect pairings for the 2007 Vellum Cabernet Sauvignon. Don't forget to read the latest news from the vineyards and cellar by clicking BLOG on our website at www.VellumWines.com or visiting us on Facebook. Jeff and I want to thank all the friends, family and the people who newly discovered us for making our first release party such a success. I thoroughly enjoyed talking to everyone and I want to personally say that the day was very gratifying. The two of us have put everything we have into Vellum and it pleases us to no end to see that the wine is so well received. For all of those who purchased the 2007 vintage, enjoy now or save for the next generation! We are hard at work on the promising 2008 vintage and planning the upcoming 2009 harvest. However, we want to extend an invitation to all those in wine drinking world, so please do not hesitate to contact us about anything. We love to hear from you! I was inspecting some vineyards this weekend and it only now occurred to me that we are entering our third vintage with Vellum. It was very difficult to imagine this point in time three years ago. There were so many more uncertainties then than we have now and we have constructed a foundation that will last for years to come. So, I want to take this time to thank those have helped us build it and to those who have been the mortar in places where we needed it most. Commercial winemaking is indeed a high risk business and mired with difficulties that only careful planning and hard work can avoid. It is not for the wealthy individuals who want to throw money at problems in the hopes that they will go away. They never do. The proof of this is far too evident here in Napa Valley and elsewhere in California. Wineries become money pits and backyard venues to entertain personal friends. But! When the end is near for them and the party is over (...as many come here to do just that! ), the winery is sacrificed for a bargain price and assimilated into a corporation's portfolio. Vellum Wine Craft is determined to avoid these pitfalls - because we are here to create and grow as our own entity. I want to acknowledge first and foremost that we are people who have the fidelity to achieve an end outside the spoils of vanity and lifestyle. As a native Pittsburgher and devout Steelers fan I learned a very important lesson early in life - - Invest in the right people the first time and put your nose to the grindstone with them. You then will never get "caught up" and do things for the wrong reasons. As fates would have it, in the end you may even get your own Superbowls! We hope in the future to attract people like ourselves to us and to our wine. It will be a great honor to meet and talk to all of you who have been with us along the way, Sunday May 3rd (and May 17th) for the very first release of Vellum Cabernet Sauvignon. Jeff could not be more right about bud-break. I am excited too (Give it up for plants Jeff! )...The 2009 vintage hinges on what happens right now! This is when we watch the weather very carefully - as do our growers. An early bud-break followed by a late frost could seriously damage our chances at a successful year. So far...we have had a lot of rain in March and fair to warm weather in April and now it is raining again - keeping any chances of frost at bay. Also, this late rain is important because it increases the water table; which in turn will help in more uniform berry-set after flowering. For some extra security?...In solidarity with our growers this year I even went so far as to plant my vegetable garden three weeks early...and lo' and behold no frost! But, as it is with my garden, we have the good graces of nature this year with us, however it is not always that way. Last year proved to have a particularly damaging early spring; which gave way to low yields during harvest across the region. As viticulturists and winemakers we made adjustments and as I maintained in previous writings, I think the 2008 vintage is our finest to date (...and I want to thank our recent visitor from Bordeaux for receiving it so well too!). So these are the fortunes of winemaking right now. They can rise and fall with the weather but it is up to us to pay attention to the details of the fruit in the meantime and address its needs early - to make great wine. I like to think that this wisdom came to me at the right time in my life and I believe now that we are going to have a very good year indeed. On Friday I spent the afternoon walking among the vines at our Cabernet Sauvignon vineyard on the south end of Napa Valley. Karl and I have raved about these vines since we first tasted their fruit - and witnessing the vines start their growth for the 2009 vintage is as inspiring as ever. I am not one to get excited over watching plants grow...BUT!...these vines are the lifeblood of Vellum. And now that the 2007 vintage is in bottle and the 2008 vintage is in barrel, I am thrilled to welcome the next vintage of Vellum Cabernet Sauvignon. The vines are just starting to push out the new growth that will carry the 2009 vintage through harvest.